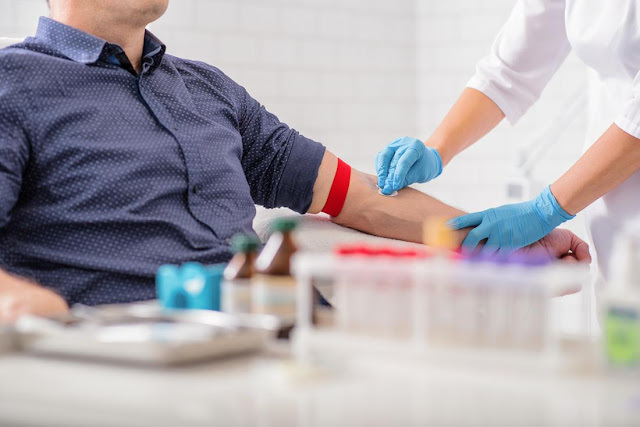 Blood Gas Analysis (AGD) or arterial blood gas (ABG) test a blood test is taken through the arteries to measure levels of oxygen, carbon dioxide, and acid-alkaline levels (pH) in the blood. Blood gas analysis is generally conducted to check the function of the pulmonary organs where red blood cells circulate oxygen and carbon dioxide from and to the rest of the body. In addition, these tests can be performed to check the condition of the organ of the heart and kidney, as well as symptoms caused by disruption of the distribution of oxygen and carbon dioxide, or pH balance in the blood, such as nausea, breathlessness, and loss of consciousness. This test is also done on patients who are using the tools of breath to monitor its effectiveness. Head or neck trauma that affects breathing. Chemical poisoning or drug overdose. Blood clotting disorders sufferers, both because of disease or because of the drug, such as anticoagulants, at risk of incurring a hematoma after taking action. There are also conditions that complicate the nurse or doctor to take a blood sample from the arterial duct, for example when the patient is less cooperative, had a weak pulse, or tremor. There is no special preparation needed to be done before patients undergo blood gas analysis. Your doctor or nurse will perform Allen test or examination of a smooth flow of blood vessels by pressing the blood vessels in the wrist during a few seconds. If patients are being given supplemental oxygen, doctors will release the oxygen hose approximately 20 minutes before the blood gas analysis test. However, it can be done when the patient is not completely relying on the extra oxygen. For certain conditions, your doctor will give you a local anesthetic to need pain can occur when the needle rapid thrusting into the arteries. As the initial step of blood gas analysis, the doctor will sterilize blood sampling point, such as the wrists, elbows, folding or folding of the thigh, with liquid antiseptic. After finding blood vessels arteries, i.e. a pulsating blood vessel, doctors will insert a needle through the skin towards the blood vessels. The amount of blood taken is usually 1 mL. After a blood sample is already taken, the needle will be removed gradually and a syringe will close a bandage. To reduce the potential of swelling, press the injection area for a few minutes after needle removed. A blood sample will soon be taken to the laboratory for analysis through the process. The patient will feel pain and discomfort at the time of the taking of the blood until a few minutes later because arteries are quite sensitive. Patients are advised not to leave the room to monitor things that may occur, such as dizziness, nausea or fainting shortly after blood taken. Typically, patients can receive test results about 15 minutes after taking the blood. If further analysis is required, the results will be given to the referring physician. Acid-base (pH) blood, by measuring the number of hydrogen ions in the blood. If the pH is below normal blood is said to be more acidic, while a pH above if normal blood values are said to be more alkaline. Oxygen saturation, i.e. measuring the amount of oxygen carried by hemoglobin in red blood cells. The partial pressure of oxygen, i.e. the measurement of the pressure of oxygen dissolved in the blood. This measurement can determine how well oxygen can flow from the lungs into the blood. The partial pressure of carbon dioxide, i.e. the measurement of the pressure of the carbon dioxide dissolved in the blood. This measurement determines how well the carbon dioxide can be removed from the body. Bicarbonate, namely chemical stabilization which helps prevent blood pH becomes too acidic or too alkaline. Based on the measurements of the elements, there are two types of gas analysis results of blood, normal and abnormal (not normal). The rate of absorption of oxygen (SaO2): 94-100%. The partial pressure of oxygen (PaO2): 75-100 mmHg. The partial pressure of carbon dioxide (PaCO2): 38-42 mmHg. Abnormal Results may be an indicator of certain medical conditions. Here are some medical conditions that may be detected through a blood gas analysis.